15 5/8 by 14 3/4 by 5 1/8 in. 39.7 by 37.5 by 13 cm. 59 1/4 by 37 3/4 by 14 1/2 in. 147.3 by 96.5 by 38.1 cm. 18 5/8 by 14 1/2 by 4 3/8 in. 47.3 by 36.8 by 11.1 cm. 24 1/2 by 46 5/8 by 7 in. 76.2 by 119.4 by 19.1 cm. 36 by 17 1/4 by 6 1/4 in. 91.4 by 43.8 by 15.9 cm. 20 1/8 by 20 by 5 in. 51.1 by 50.8 by 12.7 cm. 24 by 28 5/8 by 5 in. 61 by 72.7 by 12.7 cm. 33 1/2 by 49 1/2 in. 85.1 by 125.7 cm. 14 1/2 by 13 by 5/8 in. 36.8 by 33 by 1.6 cm. 14 5/8 by 12 3/4 by 3/8 in. 37.1 by 32.4 by 1 cm. Each: 12 by 9 in. 47 1/4 by 30 3/4 by 10 1/4 in. 120 by 78 by 26 cm. 6 1/4 by 4 1/2 by 3 1/2 in. 15.9 by 11.4 by 8.9 cm. 97 by 45 by 20 in. 246.4 by 114.3 by 50.8 cm. 121 by 90 by 56 in. 307.3 by 228.6 by 142.2 cm. 13 1/4 by 15 by 19 1/2 in. 33.7 by 38.1 by 49.5 cm. 60 by 30 by 33 in. 152.4 by 76.2 by 83.8 cm. 168 by 60 by 24 in. 426.7 by 154.2 by 61 cm. 48 by 54 by 144 in. 121.9 by 137.2 by 365.8 cm. 274.3 by 426.7 by 426.7 in. 696.7 by 1083.8 by 1083.8 cm. 27 by 39 in. 68.9 by 99.1 cm. 54 by 78 in. 137.2 by 198.2 cm. 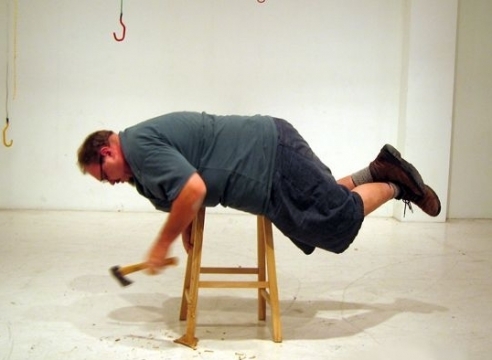 Martin Kersels’ performative practice spans sculpture, photography, installation, and action. He is best known for his laughter-inducing works that consider the dichotomies of humor and pathos within the human condition. Interested in pushing themes of scale, tension, and the effects of gravity into more conceptual directions, Kersels injects a playfulness in his work to reveal the awkwardness associated with not belonging. Documentation of performances through photography and video, which shows the artist experimenting within his own body in a series of simple actions— tossing, falling, hugging, smacking, tripping, and whirling— and his performative objects and installations uncover the darker absurdities of the body, space, and movement. Born in 1960 in Los Angeles, Kersels currently lives and works in New Haven, CT. He received from UCLA both his BA in 1984 and MFA in 1995. 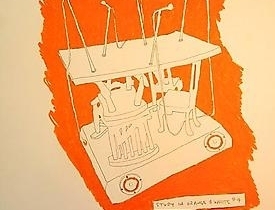 From 1984 to 1993, Kersels participated in collaborative performances with SHRIMPS, an alternative performance art group associated with artful maladroit actions that he co-founded. 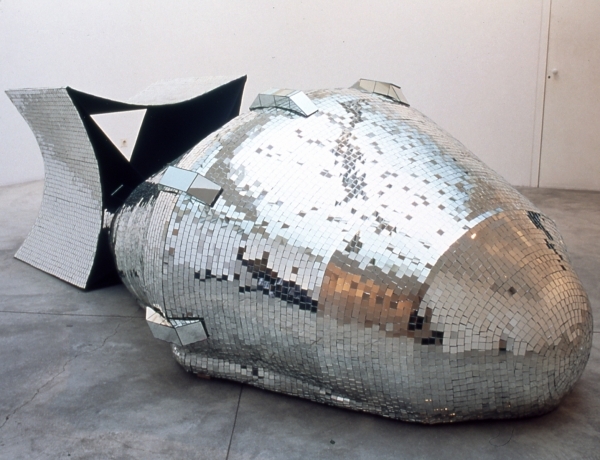 His decision to expand his practice of performative gestures and collaborations to include performative sculptures, objects, and assemblages was pivotal. 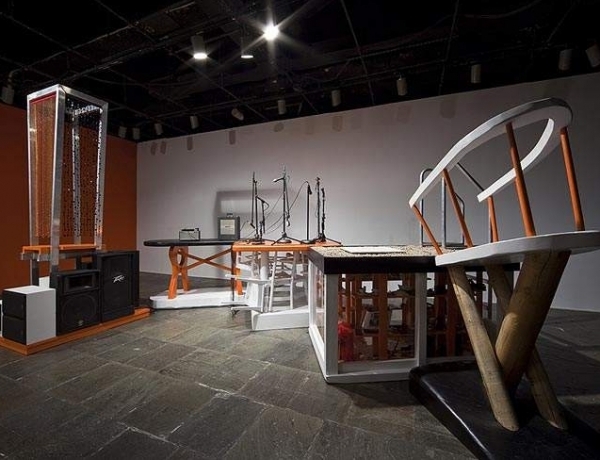 His objects and projects have been the subject of major solo and group exhibitions, including the Whitney Biennial (1997, 2010); XXXXXXXXO at Museum of Contemporary Art, Los Angeles (2013); Charms (Black Cloud/Green Dog/Little, Little Boy/White House/Silver Clouds) at Santa Barbara Museum of Art (2012); Tumble Room at Museum Tinguely, Basel (2010); Heavyweight Champion at Tang Museum, Saratoga Springs (2007) and Santa Monica Museum of Art (2008); Disorderly Conduct at Orange County Museum of Art (2008); 100 Artists See God at Institute of Contemporary Art, London (2005), and more. 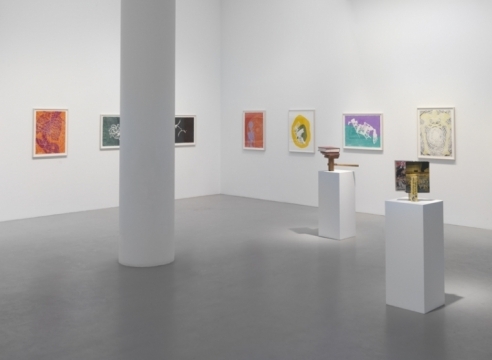 Other important exhibitions of Kersels’ work have been held at Fondazione Prada, Milan; Hammer Museum, Los Angeles; J. Paul Getty Museum, Los Angeles; Kunsthalle Bern; Musée d'Art Contemporain, Marseille; Musée Cantonal des Beaux Arts, Lausanne; Museum of Contemporary Art, Denver; Renwick Gallery at Smithsonian Institute, Washington, DC; and Swiss Institute for Contemporary Art, New York, among others. His work is held in public collections at major institutions worldwide, including Centre Georges Pompidou, Paris; Museum of Modern Art, New York; Museu d’Art Contemporani de Barcelona; Santa Monica Museum of Art, Santa Monica, Orange County Museum of Art, Newport Beach; Hammer Museum, Los Angeles; MoCA, Los Angeles; Los Angeles County Museum of Art, Los Angeles; Museum of Contemporary Art, North Miami; Fonds national d'art contemporain, Paris; Centre national des arts plastiques, Paris; and Museu d'Art Contemporani de Barcelona. All images © Martin Kersels. Mitchell-Innes & Nash is pleased to present a second performance of Monger, a new performance by Martin Kersels to accompany his current solo exhibition Cover Story. 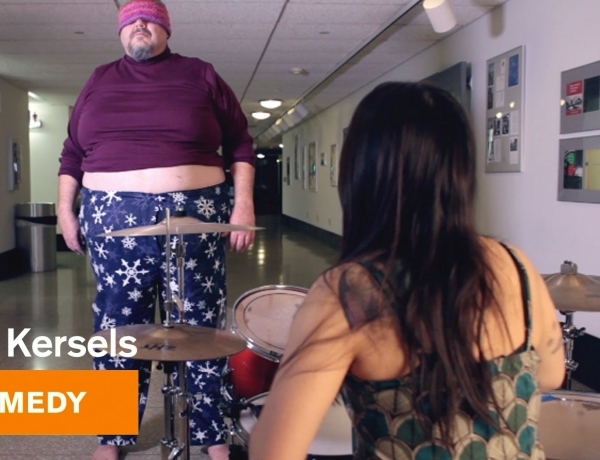 Martin Kersels often plays with what's maladapted, off, and decidedly out of shape. Kersels's playfulness often emerges from his own body—in a nod to his physique, Kersels once called a solo show "Heavyweight Champion"—and deeply informs two of his career interests, sound and physical comedy. This year, Martin Kersels, Agnieszka Kurant, and Allison Smith have been invited to present their own take on art history and consider the thematic focus of thingness. 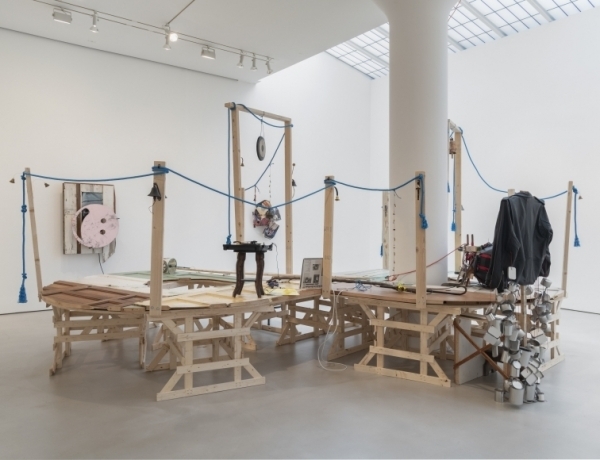 Mitchell-Innes & Nash is pleased to announce Martin Kersels in Under Destruction October 15, 2010 – January 23, 2011 Destruction in art - 50 years after Tinguely's Homage to New York Group show in collaboration with the Swiss Institute, New York. 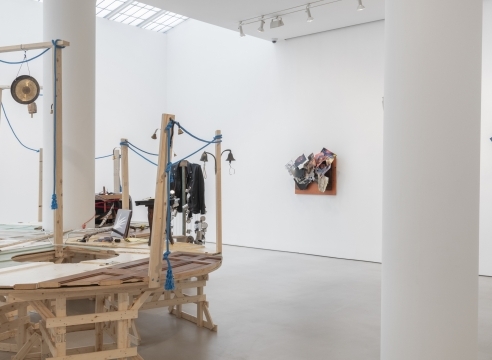 Co-curated by Chris Sharp and Gianni Jetzer, Under Destruction opens in collaboration with the Swiss Institute, New York and features some twenty internationally known contemporary artists that examine the use and role of destruction in contemporary art. Martin Kersels characteristically splits the difference between performance and objects in his exhibition at Mitchell-Innes & Nash. 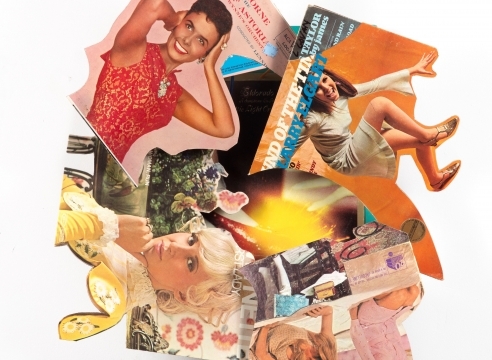 Cut-up and collaged record album covers are hung as relief wall sculptures... Part comedy, part homage, Mr. Kersels’s work is a reminder that, despite the emphasis on art as business, there is still room in Chelsea for the absurd. ompared with his large sculptures and audaciously physical performances, Martin Kersels’ pieces at Redling Fine Art are a bit subdued, but not quiet. 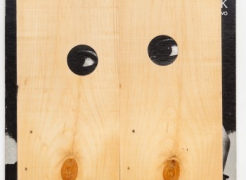 Three quirky wooden sculptures emit mysterious sounds to an audience of peeping-Tom portraits whose eyes gaze out meekly through holes drilled in planks of wood. The effect is riotously charming and comically odd, like a Dadaist hurdy-gurdy. 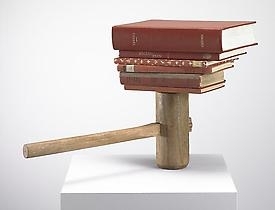 One of Martin Kersels’s new sculptures, installed at Redling Fine Art in a show called “Seen and Heard,” has a lever. Push it down, quickly, and it makes a groaning sound. On its way back up, it squeals. It’s all air pressure behind the noises. Kersels, who left L.A. to teach at Yale three years ago, calls the sculpture "Snore." Made of salvaged wood and assembled to look something like a phonograph, it conjures an antique — or an awkwardly rehabbed antique. The same can be said for the other two hand-operated, noise-making objects in the room: a bureau with a motor in its bowels and a leaning pyramid for a head, and a chair with a whirring wood box on its seat. All the “machines” go together and it’s this quaint fantasy of a pre-digital world, only none of Kersels analogue inventions have functions. They just have distinct looks and sounds. Standing six and a half feet tall and weighing around 350 pounds, Martin Kersels is a big guy. "I don't fit in a lot of places, literally and figuratively," he says in an interview published in the catalogue for his first midcareer retrospective, aptly subtitled "Heavyweight Champion." 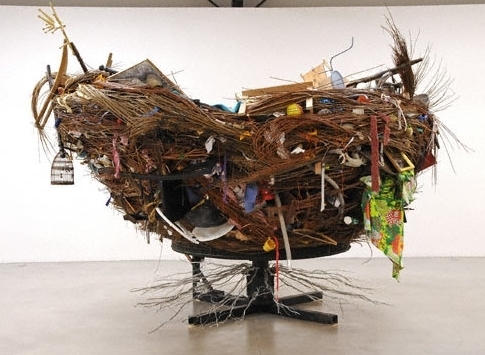 The concise survey of Kersels' work since 1994 at the Santa Monica Museum of Art, "Martin Kersels: Heavyweight Champion," opens with a monumental sculpture of a bird's nest. Gaston Bachelard wrote that 'a house constitutes a body of images that give mankind proofs or illusions of stability'. 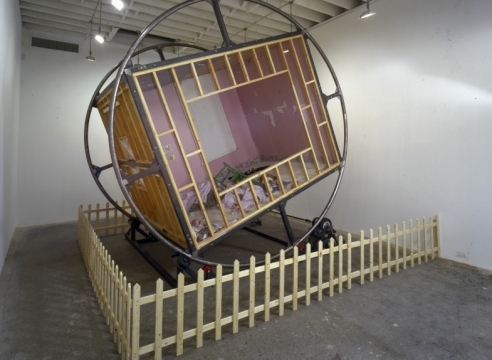 The unease attending such fragile assurances of domestic equilibrium underlies much of Californian artist Martin Kersels' recent rambunctious installation. 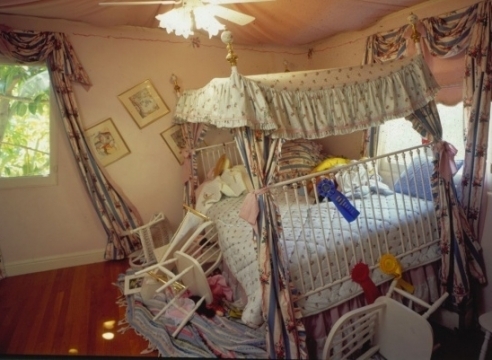 Deitch Projects 76 Grand Street, SoHo Through March 24 Although seemingly a habitat for little girls, Martin Kersels's ''Tumble Room,'' a small, sweet child's room replete with furniture, dolls, stuffed toys and other amenities, behaves quite viciously. 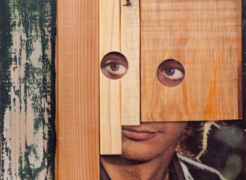 In the end, the work of most artists is intimately bound up in their identities. 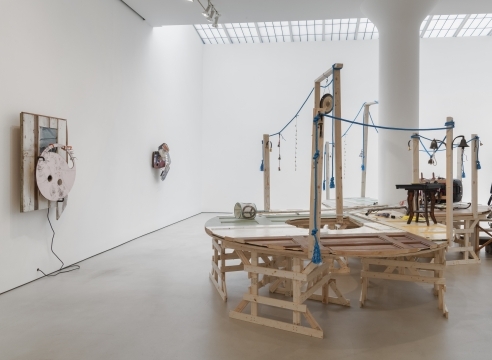 But this point has rarely been made as forthrightly or as humorously as in the work of Martin Kersels, a young Los Angeles artist who is having his first show in New York. 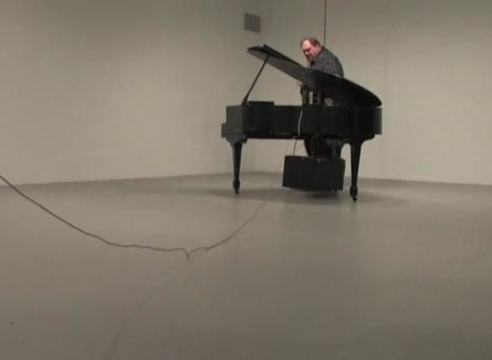 The main character in Martin Kersels' cacophonous, stop-and-go drama of a recent solo show is a baby grand piano that noisily trundles from one side of the gallery to the other, digging irregular ruts in the cheaply resurfaced concrete floor as it is dragged back and forth by a cable attached to an electric winch.